Cute womens backpack. They’re hard to come by! The bag for your daily adventures. Pick your favourite vintage look! Cute Womens backpacks. They’re hard to come by. When you think of a womens backpack, cute and stylish aren’t often two words that spring to mind. Backpacks seem to have masculine or youthful associations. There comes an age when women switch from backpacks to handbags. Maybe you want a bag for a weekend trip or you often work in coffee shops and need to bring your laptop. A handbag isn’t really the best option. But a supportive, urban style womens backpack is. Type ‘backpacks online’ and you’ll find thousands. So, why Lotus Handicrafts? No third (corporate) third party to go through. Talk direct to the makers. A backpack that tells a story. Compliments guaranteed! Pick up your new bag, if you live in Adelaide. Iran: Home of the world’s best kilim. Just like handbags are an extension of your style, so are backpacks. Express yourself, with an uniquely individual bag. 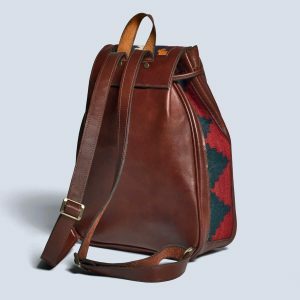 Our women’s backpacks are designed in Australia and produced by local kilim masters. Iran produces some of the best kilim in the world. And at Lotus Handicraft, we bring it to you – far, far away from our makers in the Middle East. Every piece we make has its own story. We buy the kilim and turn it into various bags and art deco items. You’ll feel it wearing it, too.